Helps new users better prepare for their upcoming experience. Helps experienced users find exactly the trip they are looking for. Patented CannaCurve visual graphs show expected head and body effects over time. Product specific! Not just generic Blue Dream - but Black Diamond’s Blue Dream Lot #127 from the Nov 15, 2014 harvest. Touch based review system runs on all platforms and devices – no separate apps required. Promotes enlightened use of cannabis and keeps users away from the Danger Zone. LiveLabels takes your product packaging to a new level with flexible and compliant information labels. Auto-generated WA i502 and CO A64 compliant labels. Create your own custom labels with CannaCurves and QR codes. Built in product Gallery and review system for users. Get up and running for free in 5 minutes, download custom labels instantly! For those looking to try a turn-key label and review system. Up to 500 labels per month: Free! For more established brands with growing distribution. For high scale producers, product owners, and dispensaries. CannaCurves are created by the community to provide more information on the actual experience of a specific cannabis product. 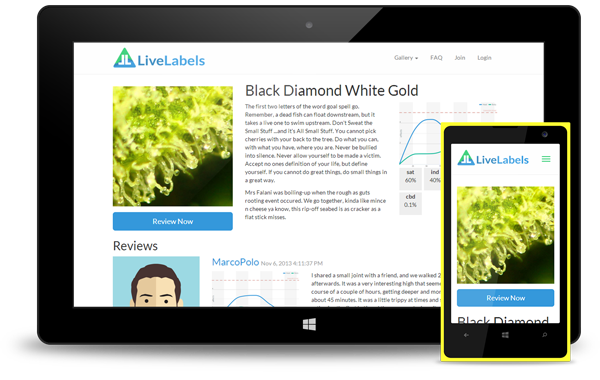 Users scan LiveLabels QR codes, or click LiveLabels links to go to that specific product page in the Gallery. Users can literally draw curves with their finger (or mouse) and then add trip report details for all the products they have tried. We embrace the fact that cannabis experience is highly subjective, and believe that these personal accounts are not only educational but also entertaining. Did those buds wake you up and send you outside for a walk? Share it! Sign up & begin adding or review products!